The thought of making dough seems to scare many people, as if there is some mystical art to achieving the perfect dough consistency. But science can aid us in the pursuit of the perfect dough. Once mastered, you’ll wonder why you were so fearful in the first place. All great doughs share similar properties, which include elasticity and a smooth, pliable structure. Each of these properties can be achieved by understanding the role of gluten, which gives some method to the madness that is dough making. Gluten in wheat flour imparts dough with elastic properties. Gluten has a long and stringy structure that can stretch like a rubber band. Thus, as dough has lots of flour and flour has lots of gluten, gluten makes dough stretchy. Unfortunately, gluten in flour is not naturally long and stringy. It’s curled up, much like a ball of twine. Therefore, it’s the job of the cook to unwind this ball of gluten, creating long strands. Gluten is converted from clump to strand through the addition of water. The temperature of the water dictates how quickly this process will occur. The hotter the water, the quicker the gluten unravels. Therefore, many recipes will suggest using warm to hot water. The smooth, pliable structure of dough is almost mystical. Its neither hard or soft, nor dry or sticky. This sweet spot of dough texture is due to the ratio of flour to water. Excess water makes a batter, while too little water renders a dough rough, dry and unpliable. Generally speaking, a flour to water ratio of 2:1 achieves a dough of reasonable consistency. So if you have 500g of flour, use about 250 mL of water. Personally, I like to add more water than required, and for this, we can remember the old saying ‘wetter is better’. For the budding dough enthusiast, it’s much easier to fix a dough that is too wet, than it is to fix a dough that is too dry. 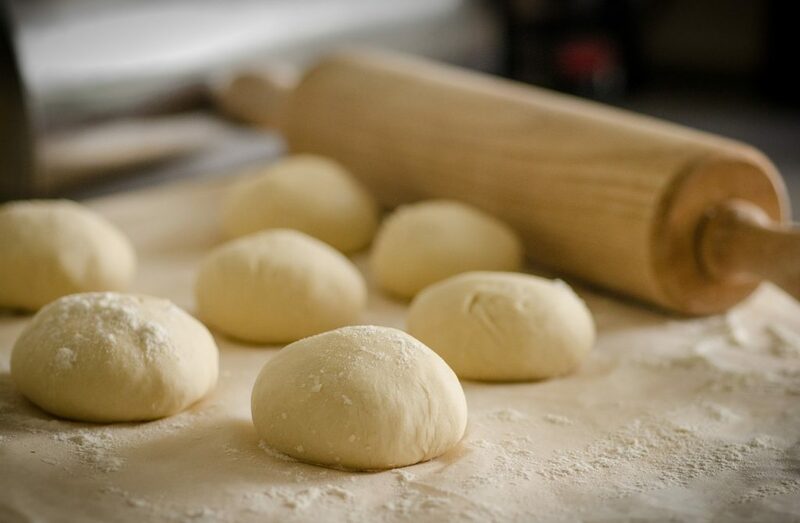 You can always add more flour to sticky dough, but it’s near impossible to add more water to an already formed dough. With our understanding of the role of gluten and the ratio of flour to water, we can begin to understand why we make dough the way we do. Most dough recipes will begin by adding water to flour, which begins the process of unravelling the gluten from a ball of twine to long strands. The next step is usually to bring the dough to a cohesive mass and knead. Kneading dough allows the gluten to further stretch, creating a network throughout the dough. This gluten network gives the dough body and structure, allowing you to pull the dough without tearing. As the dough is kneaded repeatedly, the gluten will continually stretch until it can’t stretch anymore. This is when your dough will start to feel a little tough, and no longer pliable. This is completely normal. To get your dough back to its silky self, simple let it rest. Time allows gluten to slowly relax from a super-stretched strand to a relaxed stringy substance. 15 minutes is usually enough for this relaxation process to occur, which will make your dough much more pliable. Time also allows a dough to go from sticky to silky. A sticky dough is due to excess water. But as dough is allowed to rest, it will have more time to absorb any excess water. Another reason why ‘wetter is better’. And there you have it, the science of dough. Of course, theory is one thing, practise is the key. As you attempt to make dough, try to understand each step of the process, which can help you to rectify any mistakes you may encounter along the way. Add water to flour and stir until the water has been absorbed by the flour. Turn out onto a flat surface and bring together to form a clump. Knead the dough for about 5 – 10 minutes, as you do, the dough should start to become smoother and silkier. You may need to add more flour until the dough has just gone from sticky to smooth. Let the dough rest by placing it in a bowl and covering it with a damp cloth. Resting the dough for at least 15 minutes is usually enough. The dough is now ready to be used. This dough recipe is incredibly versatile. It can be used to make dumpling skins, Peking duck pancakes, Beijing spring onion/shallot pancakes and many others. I am making tea rings out of high gluten flour and after baked it is like it has a tough skin and hard to cut through. My ingreditents are water, yeast, sugar, eggs, oil, salt, flour, I let it rise double then make into 4 small tea rings. After baked I put butter over the top, let cool, then frost. When you go to cut the tea ring to eat it, it feels tough and hard to chew! What am I doing wrong? Hey Maribelle. Sorry to hear of your experience! I haven’t made tea-rings before but if the bread becomes too tough and hard to chew, maybe there is too much gluten development. Perhaps try using a lower gluten flour and see what the result is. Good luck!